Do not knead the mince just stir gently to incorporate all the ingredients. Roll into medium sized balls, place in casserole dish and bake with the lid on for 20 minutes. 3 cups cold water and a good pinch of cayenne pepper. 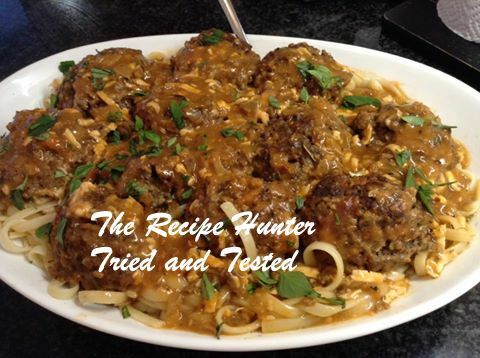 Mix well, throw over meatballs and bake a further 25 mins. Optional : After 20 mins add 1/4 cup grated mozarella cheese and 1/4 cup grated Ricotta cheese scattered over the meatballs. Cook linguine pasta according to packet instructions. Yummy meatballs not my usual recipe but I was up for a change …. Enjoy!